Back in 2011, Alan Rickman vaguely revealed that J.K. Rowling told him a "tiny piece of information" about Severus Snape, which had not been revealed in the books at the time, and aided in his performance of the character. In the wake of Rickman’s tragic passing, J.K. Rowling has now offered up that tidbit of information, and it turns out, the morsel of fact about Severus Snape wasn’t so tiny. What lies behind "Always"? Presumably, she’s referring to Severus Snape’s love for Lily Potter, Harry’s mother. Just how in depth Rowling went with that information, she didn't say. Did she tell him Snape was responsible for bringing the information about the Potters to Voldemort? That he tried to keep Lily safe and failed? That his determination to protect Harry was out of love for Lily? She gave me one tiny, little, left of field piece of information that helped me think that he was more complicated and that the story was not going to be as straight down the line as everybody thought. If you remember when I did the first film she'd only written three or four books, so nobody knew where it was really going except her. And its was important for her that I know something, but she only gave me a tiny piece of information which helped me think it was a more ambiguous route. Rickman went on to confirm that he knew Severus Snape was human and not just "an automaton." He also knew that there was "some sense of protection" in Snape for Harry, but he didn’t know that he was a double agent. Based on that and what Rowling said, I’m assuming that the answer to "what lies behind the word always" was mainly or only the most crucial piece of information to Snape’s motivation. He did and does love Lily Potter, always. That would likely have been enough to allow Rickman to play the role with more understanding of what was driving his character. The details, presumably, came later. Still, knowing the meaning behind "Always" would have been a massive secret at the time, as Rickman implies in his comments to Hitfix. 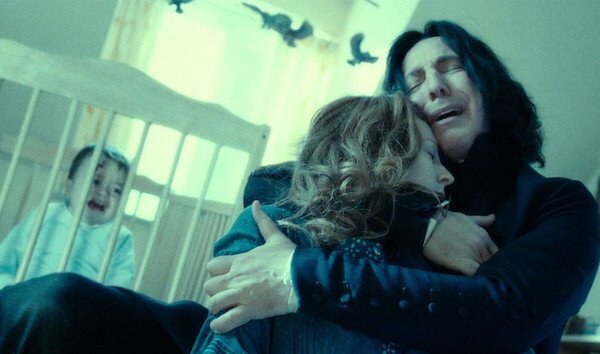 As the later books were released, fans speculated over Snape's back-story and if memory serves, the theory about Lily Evans and Snape's friendship, and Snape's potential feelings for Lily was among the many things fans mulled over. The key clue stemmed from Harry Potter and the Order of the Phoenix, when Petunia mentioned "that awful boy," whom she doesn't actually specify by name, and which Harry just assumes to be a reference to his father. The full truth about Snape was not revealed to us until Harry Potter and the Deathly Hallows was released in 2007, which was about 6 years after Sorcerer's Stone hit theaters. The closure and establishment of "Always" featured in Harry Potter and the Deathly Hallows, heartbreaking though it was, did not disappoint. The same can easily be said for Alan Rickman’s portrayal of Severus Snape in the feature adaptation’s final installment, particularly in the end, when Snape’s role in the story came to a close, and he took one last look at Harry’s eyes before disappearing through the figurative veil. The many fans who appreciate Alan Rickman’s portrayal of one of Harry Potter’s most interesting characters are likely to be just as grateful to know that this key piece of information contributed to Rickman’s understanding and portrayal of his character.